Filmmaker and visual artist Helen Anna Flanagan took a moment to engage in conversation with The Film and Video Poetry Society about the film The Dynamists. 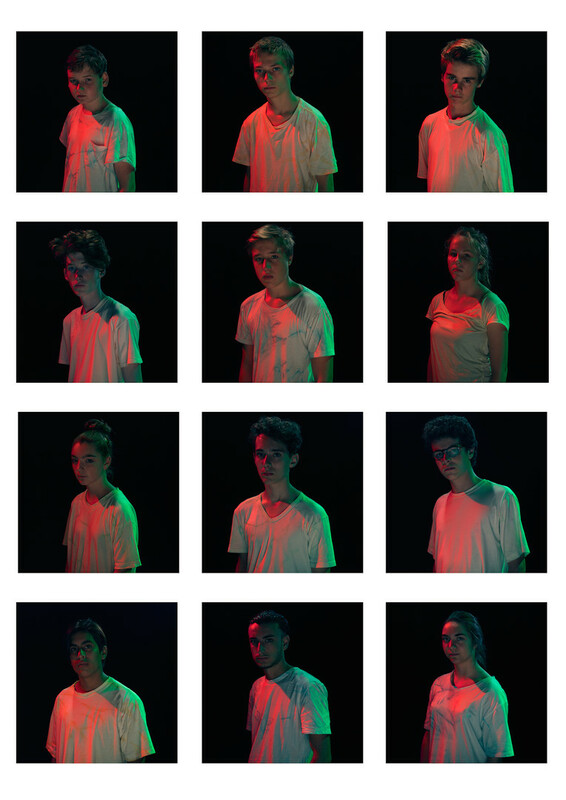 This short experimental film involves twelve disruptive teenagers and poet (as well as front man for the band Von Plastik) Herr Amadeus von Krank. Alluding to the Coming of Age movie genre, with its 'rites of passage', the video attempts to capture the transitional instability of adolescence and proposes disruption and conflict as an essential part to growth. Let's get started. FVPS: Filmmakers who practice experimental film often have various ways of defining it. What are the parameters that may guide you through the creation of your work within this genre? HELEN ANNA FLANAGAN: Experimental film for me is about resisting categorization and playing with conventions and expectations, reworking or skewing them. My films often start with an idea that transforms and builds itself by bridging gaps. As for parameters, I would rather my work be open to multiple readings and think that this somehow comes naturally with my personal way of working. There is always some internal logic to the scripts and film, but it is not always so clear or enforced. I think it is more beneficial when things are reinterpreted, or misunderstood. FVPS: What role does poetry play within your film The Dynamists? For instance, poet and performing artist Herr Amadeus Von Krank reads a simple recipe and then reads the words of his own poetry. HELEN ANNA FLANAGAN: The fluctuation from one text to another was triggered by forms of disruption. The banal pancake recipe in English is juxtaposed with Herr’s poetry in Dutch and this creates a violent dance between language and comprehension. I am interested in how dialogue can go in many spontaneous directions, that communication has the possibility to go somewhere completely different when interrupted, or through it’s own breaking. Also, the text offers contrast not only because of the different languages spoken, but because of the nature of the text. The recipe can be considered instructional and the poetic lines as expressive. The idea of the fragment plays an important role for both here, and each of these texts relies on that as a sort of tempo… A broken tempo, I guess. Still from the film The Dynamists (2017). Poet, musician, and performing artist Herr Amadeus von Krank. FVPS: How do you conceptualize sound and silence within your films? HELEN ANNA FLANAGAN: The sound or music in each film is related to the overall concept of the video i’m making at the time. The Dynamists has a cover of Shout by Tears for Fears, by Herr’s current Belgium band Von Plastik. As with Herr’s language that breaks, much like an adolescents voice when going through puberty, so does this specific track through the edit. The music accompanies the end part of the film showing an overview of the young teenagers in a sort of group tableau scene. Every time there is a physical slap of a person or the crash of a skateboard, the track suddenly stops and there is a violent and sudden cut to black. For me it was important for there to be the feeling something harsh and volatile was happening. The track itself is not only iconic and familiar, but the lyrics are also suggestive and relate back to the voice. The Dynamists - Felix Weishut, Gust Stinckens, Liam Rossignuolo, Senne Martens, Dries Vandersmisseen, Aster Froyesn, Sasha Kerensky, Jonathan Veenhuysen, Lenny Gaethofs, Steven Brouns, Lisa Lahaije, En Mateo Reeskens. FVPS: The description for The Dynamists says the film involves twelve disruptive teenage boys, though we think we see some girls in there. Have you taken an approach to gender as you characterized the ensemble within your film or does the cast symbolize a "general" attitude of adolescent spirit? HELEN ANNA FLANAGAN: An initial influence, and where the name The Dynamists came from, was inspired by The Futurists art movement a - collective who emphasized youth, speed, violence, technology, etc and made works fixated on dynamic sensation. They were also known for being predominantly sexist and male-inclusive. The futurists embody an adolescent spirit, an energetic and unapologetic gang part of a temporary and short-lived moment in art history. FVPS: When watching the film we can't help but think that you are frequently exposing and revealing new elements and factors to everyone on set and that there is never a chance to reshoot or find a moment once it has passed. HELEN ANNA FLANAGAN: There is no rehearsal prior, but instead there is a loose script that forms the basis and guide for filming. Leaving the camera running was an important technique to capture more improvised and authentic moments, such as mistakes or hesitations, restlessness, boredom, exhaustion, etc. This means that certain parts cannot be reshot and are based on chance. That is always an exciting part about shooting - you can never fully determine or predict behaviors. FVPS: Would you please muse for us on the relationship between poetry and cinema (in general) as here at the Film and Video Poetry Society we revere experimental film/ though reify cinema that is driven by the spoken poetry. HELEN ANNA FLANAGAN: Poetry has the potential to create different positions and perspectives that relate to the medium of film. Film and the language of editing are based on sequencing, editing and timing; fragments put together to create a whole to try articulate or suggest something outside of itself. I came across this quote that i’ve kept onto by Arthur Henry Hallam: ‘Rhyme contains a constant appeal to memory and hope; it sets up an expectation, and reassures us when it arrives’. I think the same could be said for music, dance, film, etc. I think such rhythm or expectation can be played with to create different experiences or expectations, to disorientate and surprise. It’s interesting after that to then try lull or seduce the viewer back into the safe reassurance of the familiar. A sort of compromise between different frequencies and resonances. FVPS: Do you practice within any other mediums asides from film? HELEN ANNA FLANAGAN: Most recently i’ve been experimenting with installation, or ways to present film or video in a space outside of the standard screening format by bringing in new materials. I am interested in having elements of a film come into a space in one way or another and to alter a viewers passive relationship to the thing that they watch. I am fascinated with the different ways you can access or watch moving images and how that changes your experience and relationship to it, the people you watch it with, or the space you are in. FVPS: What would you like the viewers of your experimental films to learn or experience as they view your work? HELEN ANNA FLANAGAN: I don’t want to offer any clear or precise meaning. I hope that people can take something subjective from it, that they can engage and make their own associations, or be perplexed, entertained, confused, angry. I’m not exclusive to any specific feeling or emotion, but rather happy when people watch it or engage with it and construct their own meaning from it. FVPS: Would you share with us what you may be working on presently? HELEN ANNA FLANAGAN: I’m in the last parts of editing a new film called Swamps & Ponds i’ve made during a three month artist residency in Graz, Austria. It is loosely based on the speculative origins of the 19th century Styrian arsenic eaters, a collective of peasants known as the Toxicophagi who were written about by the physician and naturalist Johann Jakob von Tschudi in 1851. The Toxicophagi used arsenic regularly and were thought to have become immune to the poison due to regular doses. They ate the arsenic either to acquire a fresh complexion or to facilitate respiration when walking or working in the mountains. This poison is used as a symbolic starting point to explore the power of invisible substances or structures and the tolerance of an overlooked collective. By repurposing this compound, the aim is to explore the implications substances and ‘invisible’ toxic forces have on group formation and dissolution; hierarchies and power; and subcultures and intoxication. FVPS: Wow. (mind blown) We are sure to research the Toxicophagi. Thank you very much Helen for taking the time to speak with us. Helen Anna Flanagan's film The Dynamists is screening at 1:00pm on Saturday, April 28, 2018 during The Film and Video Poetry Symposiums PURE MERCURY film block at The Revive Theater on 12420 Santa Monica Boulevard in Los Angeles, California 90025. Click here for the full program.